Building A Good Working Relationship is.. This Building A Good Working Relationship workshop is ideal for anyone who would like to gain a strong grasp and improve their time management. The duration of this Building A Good Working Relationship workshop is 1 full day. Knowles Training Institute will also be able to contextualised this workshop according to different durations; 2 full days, 1 day, half day, 90 minutes and 60 minutes. 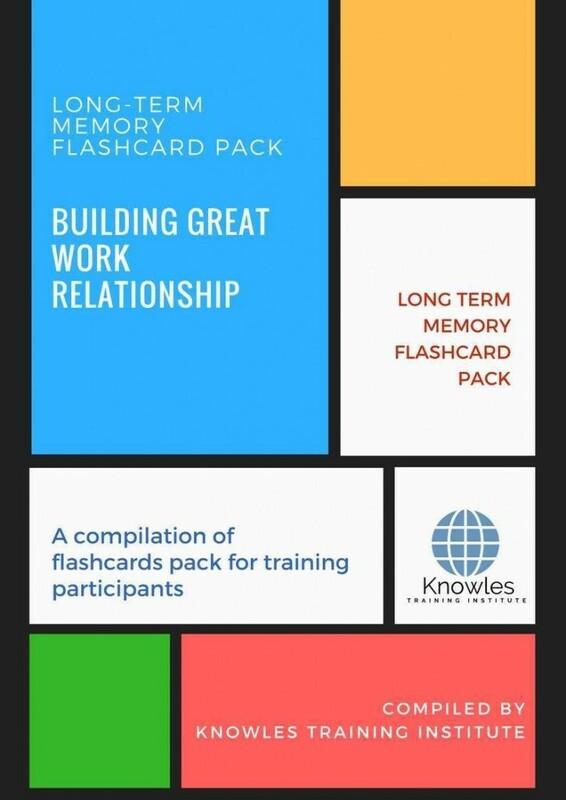 Apply knowledge on building working relationships to increase people participation and engagement at the workplace. Apply employee engagement skills to improve connection between employees and managers. Incorporate staff involvement in business activities to enhance confidence and self-esteem. Employ team building skills to develop effective team work that benefit employees and organizations. Engage learners to know their needs and develop relevant professional development resources that meet employees’ goals. Employ employee engagement skills to develop team work strategies and activities. Incorporate people skills in working relationships to build synergy and unity of purpose among employees. Employ working relationships to improve employee morale and productivity at the workplace. Apply team work in work environments to stimulate an innovative, healthy and satisfied staff. Use knowledge on building relationships to encourage coaching and mentorship among employees and managers. 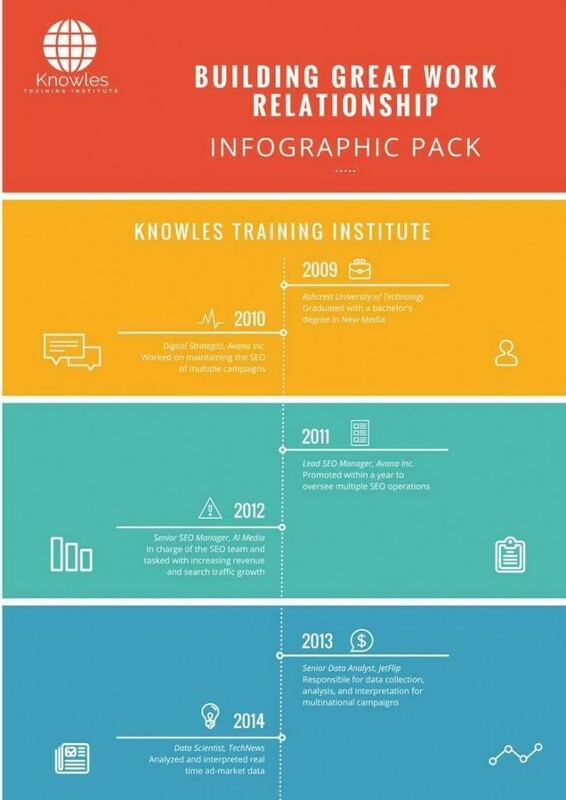 Incorporate employee engagement in learning and working to elicit employee participation. 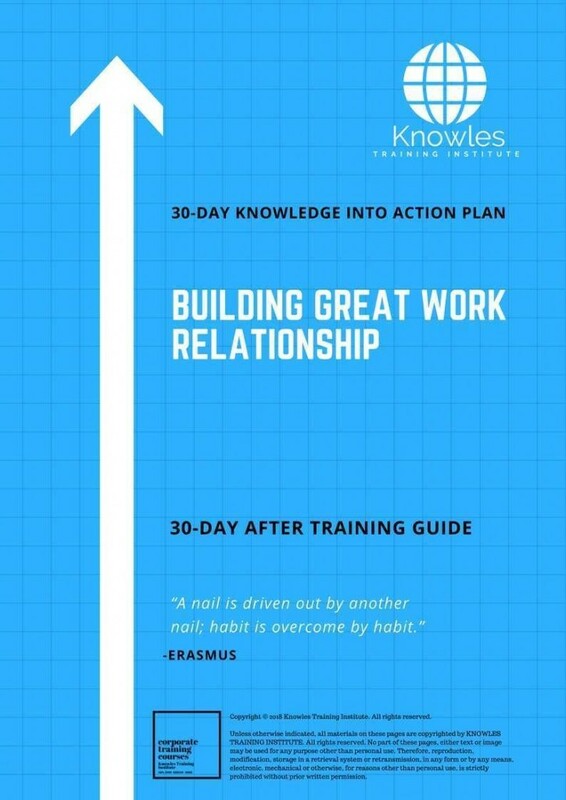 Apply knowledge to build strong, positive and healthy people relationships through work interactions. Incorporate healthy working relationships at the work environments to promote knowledge sharing and better work outcomes. Understand the meaning of a working relationship and the value of a good working relationship. Recognize the elements and qualities of a good working relationship in an organization. 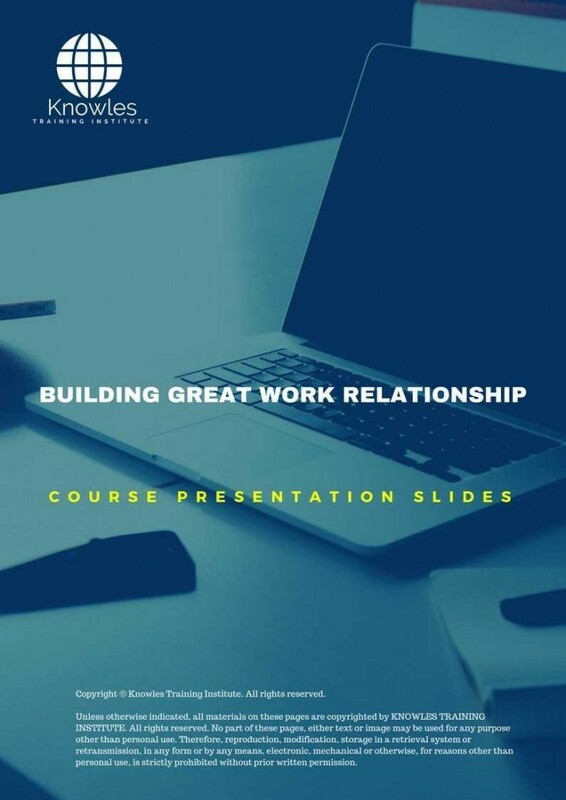 Learn the steps and process of building a good working relationship at the workplace. Understand the methods of building good and effective working relationships with coworkers. Know the professional skills to effectively build and maintain good working relationships with coworkers. Understand the importance of building and maintain a good working relationship with coworkers. 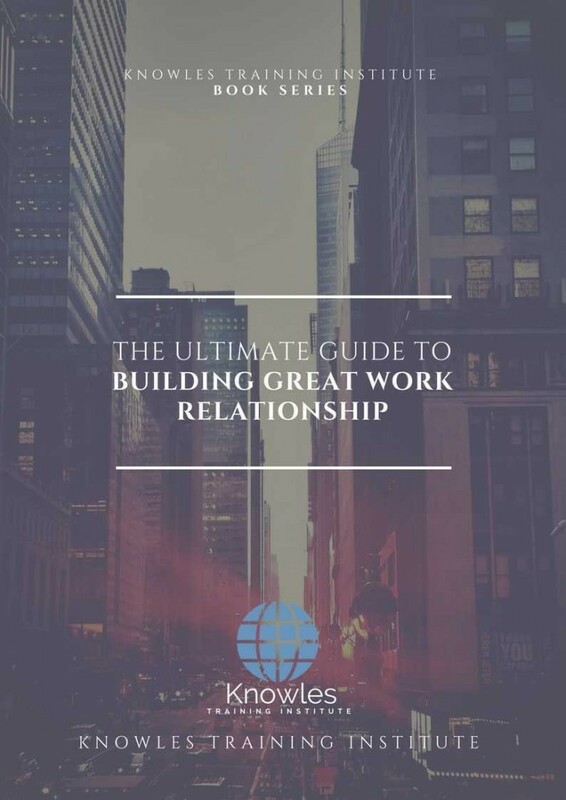 Appreciate the types of working relationships prevalent in the corporate organizations and how to select the most important relationships suitable for a specific work environment. Understand the factors to consider when building working relationships with coworkers. Explore examples of good working relationship in corporate work environments to emulate. Learn the indicators of differentiating good from bad working relationships at the workplace. Appreciate the role of the employees and managers in the process of building good working relationship. 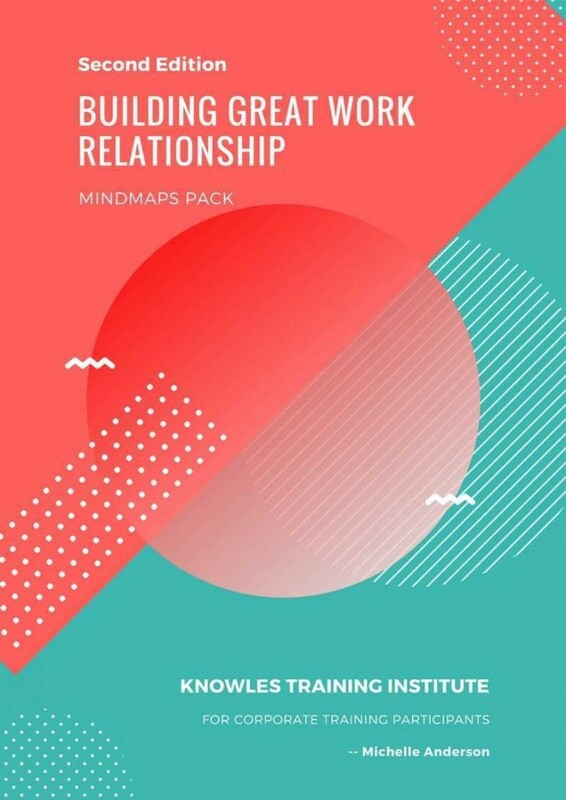 Discover the methods of assessing effective working relationships at the workplace. Learn tips to improve the methods of engaging employees in building and maintaining good working relationships. What is the meaning of a working relationship? What is the value of a good working relationship? What are the elements and qualities of a good working relationship in an organization? What are the steps and process of building a good working relationship at the workplace? What are the methods of building good and effective working relationships with coworkers? Which professional skills and approaches can employees use to effectively build and maintain good working relationships with coworkers? What is the importance of building and maintain a good working relationship with coworkers? What are the types of working relationships prevalent in the corporate organizations? How do companies select the most important working relationships suitable for a specific work environment? What are the factors to consider when building working relationships with coworkers? What are some examples of good working relationship in corporate work environments to emulate? What are the indicators of differentiating good from bad working relationships at the workplace? What is the role of the employees and managers in the process of building good working relationship? What are the methods of assessing effective working relationships at the workplace? In what ways can organizations improve the methods of engaging employees in building and maintaining good working relationships? 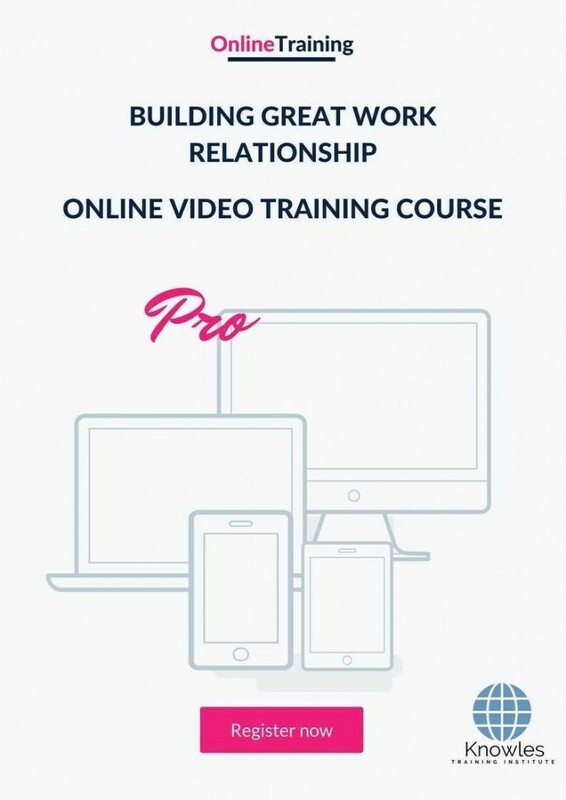 There are 3 pricing options available for this Building A Good Working Relationship training course. 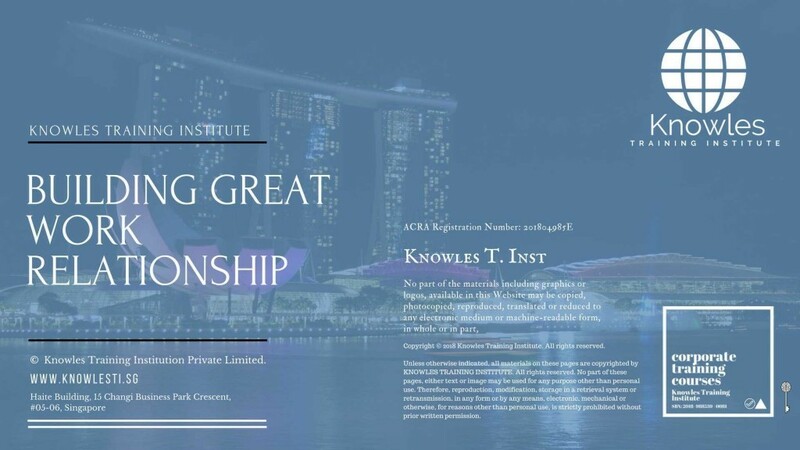 Course participants not in Singapore may choose to sign up for our online Building A Good Working Relationship training course. 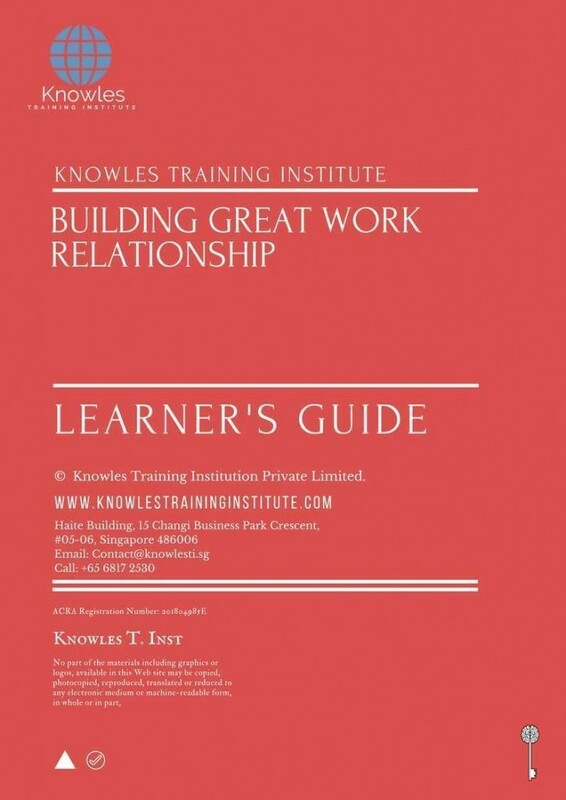 Request for this Building A Good Working Relationship course brochure. Fill up the short information below and we will send it to you right away! 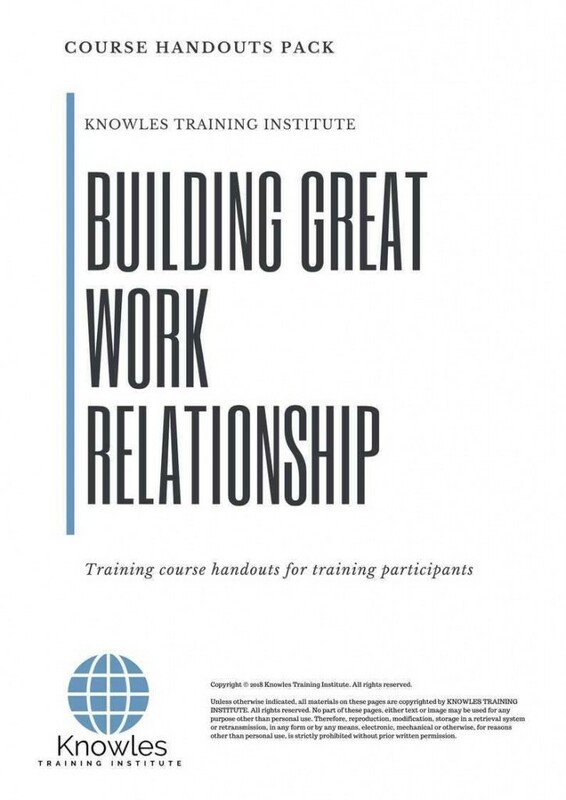 Register For This Building A Good Working Relationship Course Now! Share This Building A Good Working Relationship Training Course! Building A Good Working Relationship course, workshop, training, class, seminar, talk, program, programme, activity, lecture. Building A Good Working Relationship courses, workshops, classes, seminars, talks, programs, programmes, activities, lectures in Singapore. Building A Good Working Relationship improvement tips, Building A Good Working Relationship techniques, improve Building A Good Working Relationship, improve Building A Good Working Relationship games, Building A Good Working Relationship improvement exercises, improve Building A Good Working Relationship power, how to have good Building A Good Working Relationship, how to have good Building A Good Working Relationship in studying, how to build up your Building A Good Working Relationship, how to improve Building A Good Working Relationship how to improve Building A Good Working Relationship course in Singapore. 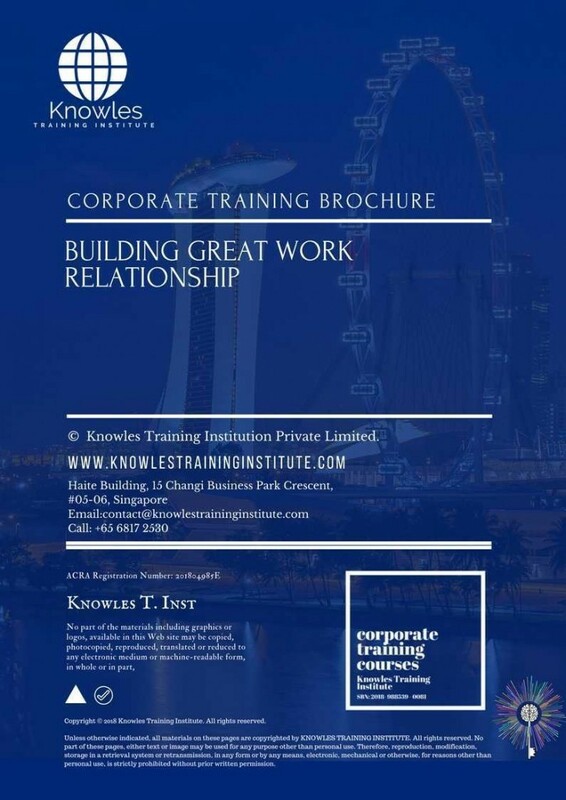 Enhance, boost, build up, enlarge, heighten Building A Good Working Relationship course in Singapore. Increase, intensify, raise, reinforce, strengthen Building A Good Working Relationship. Upgrade, amplify, boom, elevate, exaggerate, magnify, grow, gain Building A Good Working Relationship. Develop Building A Good Working Relationship, multiple, power up, beef up, bolster, establish, extend Building A Good Working Relationship. Invigorate, restore, step up, toughen, empower, fortify, regenerate Building A Good Working Relationship. Rejuvenate, renew, escalate, expand, maximize Building A Good Working Relationship. Powerful, mighty, impressive, competent, great, excellent, exceptional Building A Good Working Relationship in Singapore. Superb Building A Good Working Relationship. Super, superior, strong, solid, active Building A Good Working Relationship training courses and workshops in Singapore. Building A Good Working Relationship enhancement, booster, building up, enlargement, heightening, increment, strengthening, amplification. Building A Good Working Relationship magnification, growth, development, power, empowerment, regeneration. Building A Good Working Relationship rejuvenation, development, escalation, expansion. 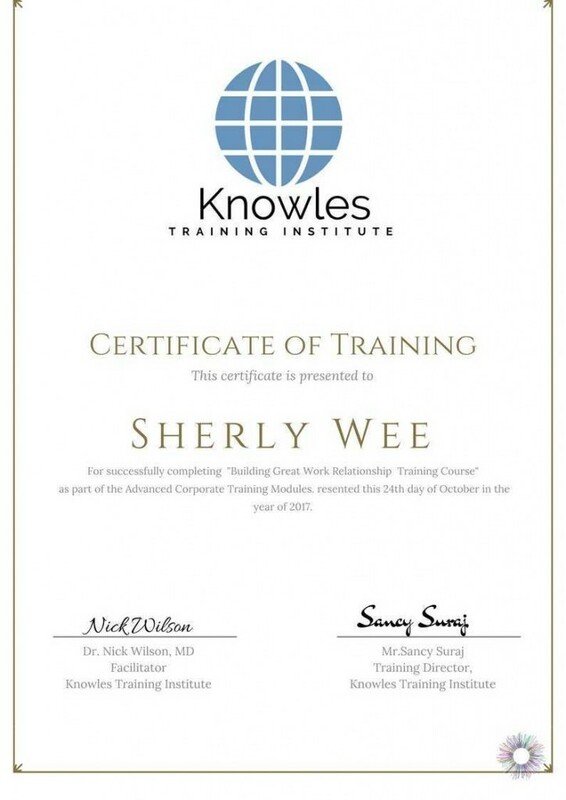 Building A Good Working Relationship maximization, power training courses & workshops in Singapore.